Rediscover the original, multi-player mobile game. Rediscover the original, multi-player mobile game when you find yourself sitting at a real-world table, talking and laughing face to face with friends and family as you clack down your matching dominoes. 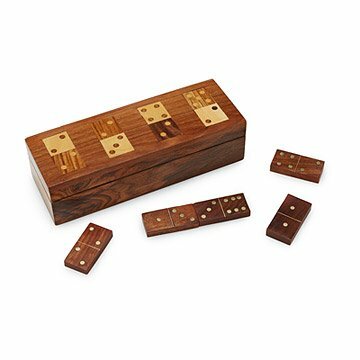 This traditional game is even manufactured using old-fashioned methods: it's hand-carved from beautiful, sustainably harvested rosewood and shaped by master artisans using hand tools. And with its handsome, hinged carrying case, any flat surface can be upgraded to a platform for instant happiness. Handmade in India. Multiple inlaid woods make this a beautiful set. This was a gift for my husband for Christmas. He loves playing dominos and I thought this was a very nice set. The domino set is being used as a therapy tool for residents in a skilled nursing facility. This is a very good tool during standing tolerance and balance performance of the patient in order to divert their attention from the time and rather focus on the game. My father gave me a set of dominoes over 50 years ago. I'm giving this set to my older son to carry on that tradition. Beautiful wood box. Makes a nice accent piece plus a good family game. No cons at all ... exactly what I expected based on the photo and description.